Hama - Houmeissa. Vinyl LP. Bleep. Sahel Sounds release a lot of great music, but even by their standards this one is something special. 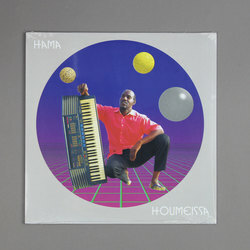 Hama is a musician from Niger whose highly original brand of electronic music must be heard to be believed. On Houmeissa, his second record for Sahel Sounds, Hama’s keyboard and drum machine odysseys pitch the Tuareg blues of his homeland against sounds drawn from Detroit techno, synthwave and Saharan folk music. The resulting compositions are danceable, meditative and hypnotic all at once. You’ve never heard it like this before.